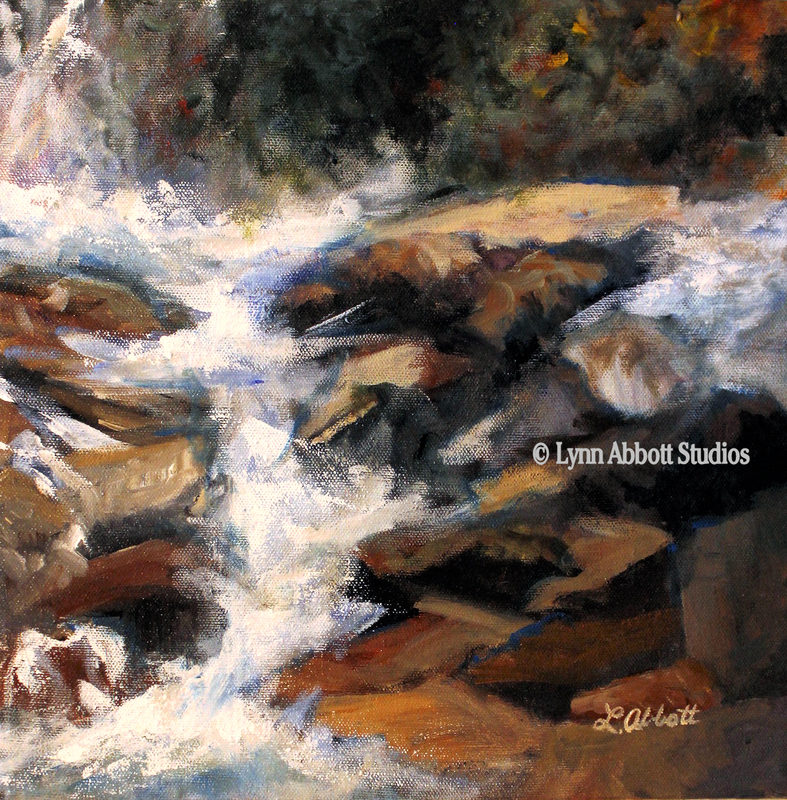 For Love of Water, © 2015, Lynn Abbott Studios. Used with permission. As far as I was concerned, it was perfect. Nestled in beautiful one hundred-year-old trees, the colonial-style home sat back from the street. Although the house was recent construction, the builder had taken pains to reproduce a decidedly historic feel. The family room windows looked out into the trees. I recalled the tree house that I had so loved as a child. And since God had opened the doors for our business in a new city; finding a new home became our next logical step. We made an offer, and the seller accepted. Within days, we put our then current house on the market. I had high hopes. And then, the waiting game began. And the “keeping it clean” task filled much of my time. In August 2006, the air began to leak from the Real Estate bubble. Most realtors denied any difficulties. I tried to persuade our realtor to reduce the asking price for our house. I told him it was too high, but he didn’t believe me. And so we waited, and waited. And waited some more. The seller of the dream “tree house” gave us an extension… but the economy dragged. My heart broke when we finally let the tree house go. Discouraged, we took our home off the market. We had tried everything. But to no avail. The market continued to fall… and all stacked against us. I couldn’t understand it. It seemed so clear that we were to move. And I had found this “perfect” house in what would be our new community. And wasn’t a house just a house? Even so, our path home was mysteriously blocked. Bogged down even. And I felt extremely frustrated. We decided to pursue another route, and so returned to the house hunt. Real estate companies got creative. Even so, nothing budged. I just couldn’t understand it. God had opened career doors…why didn’t He provide the basic “roof over our heads”? Of course, it shouldn’t have rattled me the way that it did. After all, I had seen Abba provide for us on many occasions. Nevertheless, I worried. I tried to leap over the roadblock. Then, I pushed and pulled those barriers. I huffed and I puffed. But I could not blow the wall down. Maybe, you’ve been there, too. Everything lines up and clearly points to a beautiful destination. You buy a ticket and board life’s metro. However, for some unknown reason, the train comes to a halt. You sit for what seems an interminable amount of time between stations. Maybe, like me, you look to your own personal resources. Then, you remember… You are stuck in the middle of tunneled track, waiting for something, for anything, to happen. Yup. Been there; done that… just yesterday. At times like these, if I were to simply recall the Israelites and their brush with the prophet Balaam, I could save myself a lot of irritation. I could avoid the unproductive, anxious spin. Indeed, I would forestall a whole lotta tension headaches. Even though Balaam was no saint, I find comfort in his story. Yahweh actually redirected Balaam, and as a result, protected both the prophet and Israel from disaster. A street savvy, opportunist, Balaam probably looked for additional income wherever he could. Thus, when the panicked Moabite King contacted the prophet for help, Balaam seriously considered the King’s request. In Numbers 22, we read that Moses and the Israelites camped outside of Moab. During those years wandering in the desert, the nation had grown. Now, they were a massive people group, and had a fierce reputation. After the first debacle and resulting 40 years of wilderness wandering, God finally lead His people once more to the Promised Land. In addition, He even gave them a decisive victory over the Amorites. Thus, Israel had overcome a huge obstacle and had conquered Amorite land. Clearly, Balak–King of Moab–had something to fear. So he called Balaam, a renown prophet, and asked Balaam to curse Israel. As I read the book of Numbers, I find it hard to determine where Balaam stood with God. As a prophet, he certainly knew of God. Yet, the dubious prophet did not live among the community of faith. Balaam did not travel with Moses and, in fact, even served Israel’s enemies. Balaam may have been a genuine believer, but the world called. He may have once professed faith, but he lived for himself. Balaam certainly was politically and economically savvy. He knew how to walk the line. He’d made a career of fence-sitting. Thus, the first thing he did was to size up his options. He actually prayed, and asked God for direction. Problem is that his prayers weren’t truly honest; he didn’t really want direction. He simply looked for permission to do what he already had determined to do. I frantically run ahead. I don’t stop to consult my Heavenly Father. I may believe my situation isn’t of interest to Him. Or sometimes, I think the problem is small enough that I can handle it myself. Oops. That doesn’t bode well. It didn’t work for Balaam. Of course, his motives weren’t initially obvious, but as the recorded events of Numbers 22-24 demonstrate, Balaam definitely sought his own way. He started well. Or so it seemed. He initially refused to curse Israel. He paid lip-service to God. But, when pushed, he followed his own understanding. Seizing the opportunity, he used Balak’s fear to personal fiscal advantage. You bet. Balaam habitually walked the fence. Maybe, Balaam suggests, the LORD will change His mind. Or quite probably, it is actually a case of a mercenary slyly holding out for higher wages. Obviously, Balaam had no intention of waiting on God. Indeed, God had already spoken. The case was closed. But Balaam looked for a way to reopen it. He wanted wiggle room. He planned to have it his own way. That is, to a point. In essence, Abba recognized Balaam’ rebellious heart, and at first, allowed the prophet to go his own way. Yet, God also said, “…but only the word which I speak to you shall you do,” (Numbers 22:20). In other words, our wise heavenly Father sometimes allows His children to walk the ledge, but He stands near, unwilling to allow His child to plummet over the precipice. Working behind the scenes, our Sovereign Shepherd has it all in hand. In spite of us. Abba allowed Balaam to learn the hard way; yet, God also protected Moses and the children of Israel. Abba actively directs all things for our good… And I mean everything. He misses nothing. He easily teaches one while simultaneously protecting the other. He allows humanity to pursue its often faulty paths; however, He also prevents us from going over the edge. He sets the water’s boundaries. He circumscribes the creek’s flow. Christ, our solid rock, defines the river bed. The remainder of Balaam’s history borders on the absurd. This crafty fox of a fellow thought he had it all figured out. But God used a donkey to suggest otherwise. Yup. Our Father evidently has a dry sense of humor. Balaam nearly loses all patience with his beast of burden when the poor animal suddenly refuses to budge. Balaam actually exhibits road rage, and his faithful donkey feels the sting of her master’s whip, (Numbers 22:23, 25, 27). Scripture records that God then opened Balaam’s eyes and the prophet saw “the angel of the LORD standing in the way with his drawn sword in his hand,” (Numbers 22:31). “I have sinned,” he confessed,”for I did not see know that you were standing the way against me. Now then, if it is displeasing to you, I will turn back,” (Numbers 22:34). But the train did not reverse. God had other plans. Instead of offering the planned curse, Balaam blessed Abba’s children. Despite Balaam’s stubborn missteps, God protected both His beloved people and the prophet, too. God holds the prodigal as well as the faithful child. When we wander, we still belong to Him and yet, we battle boulders-sized barriers. You see, God had promised Abraham that “I will bless those who bless you, And the one who curses you I will curse. And in you all the families of the earth shall be blessed,” (Genesis 12:3). For this reason, it was necessary to protect Balaam from his foolish choice. Abba loved Balaam enough to block Balaam’s disastrous detour. Indeed. God protected His willful prophet as well as His chosen people. In fact, when God calls you and me to enter His promise, He walks with us. He tenderly leads us even though we do not always recognize His shepherd’s staff. And we can be sure that He will never allow His plans to be thwarted. Balaam discovered this the hard way. We will certainly face some obstacles. But you and I can count on this: no matter how determined or powerful the opposition may appear, Abba is in control. In addition, my Father demonstrates great grace. Balaam’s history shows me that although we may periodically wander, the Shepherd ultimately intervenes. He will not allow His sheep to hurdle off the cliff. Thus, while grace permits us to go our own way, Abba ultimately calls His prodigals home. We may slip through the back door, greatly humbled and corrected by a donkey or temporarily sullied by life in a pig sty. Yet, Abba embraces us with open arms. He intervenes for my good. After months of seeming stagnation, our house finally sold. In that same hour, I learned that I had Stage 3 breast cancer. Suddenly, it became clear that neither the tree house nor its substitute worked: the tree house had become entangled in probate court; its back-up would not be available until mid-chemo. Prior to that, I couldn’t imagine that grace blocked the path nor would I have understood the necessity if I had. Yet, in His infinite omniscience, God used the stalled Real Estate market to protect us. He saw what I could not. And He is more than able to redirect my life’s course, and bring blessing from what first appeared a curse.